Thanks to ScanCafe, more pictures of Beth’s London days, and a few different trips abroad. Instead of getting my own scanner, I decided to let ScanCafe do it. You send off your negatives and get them back with a DVD of the scans. It takes a while, but the quality is great and you don’t have to do any real work. So here is all the pictures from our wedding day. Here are some nice pics of an ultimate frisbee game in the Presidio. They were all taken by Esther, wife of Emmett, one of the players. She was gracious enough to come photograph us for this game. My main site was looking a bit skeezy, so I spruced it up with some new CSS. Thanks, ExplodingBoy, for the menus. And I moved my picture gallery to Picasa. Same old pictures, but I’m getting a scanner soon so there are more on the way. 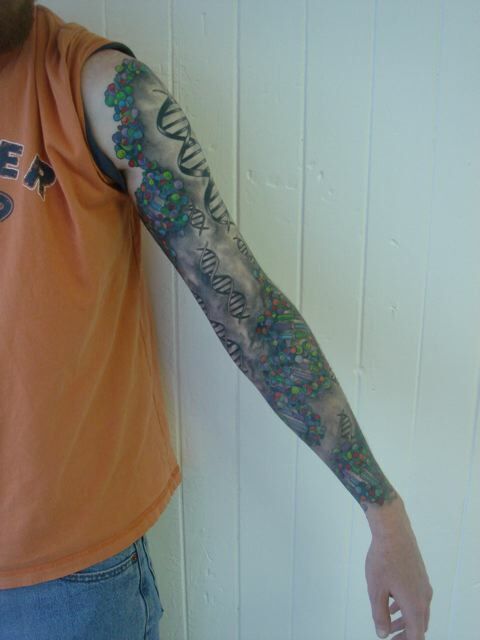 I liked my first one so much I decided to extend the DNA theme down the rest of my left arm. Since my first artist wasn’t too keen on custom work in the first place, I did some research and found Daryle Fountain at what was then Modern Electric Studio and is now Mojuju Tatu (they moved and added another artist). Anyway, after about six months and thirty hours in the chair, here are the results, thank you Daryle!.